Welcome to our corner of the world at Trinian German Spitz (Mittel). We first became involved with the German Spitz some 11 years ago at Blacklore Kennels owned by Lorraine Dyson, one of Australia's well known and respected breeders. She produced many Best in Show winners and Group awards across all age classes. Several have achieved Grand Champion status. 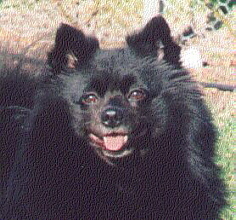 Purchasing my first German Spitz Mittel in 1998, we now have 5 with us. They have all achieved Australian Champion status and excelling in the show ring with many awards. We are a small dedicated breeder of German Spitz Mittel and to date have successfully bred healthy pups that meet the Breed Standard and intend to continue breeding a compact short-coupled specimen of our lovely breed. Ian & I would like to take this opportunity to thank Lorraine Dyson for her ongoing help, guidance and advice."